2. Send an email to sales@simplywoodrings.com and include the model # of the ring that comes the closest to what you desire and explain how you want it customized. For example “instead of 8 mm we want it in 4 mm width; and we would like it in 14 Kt. 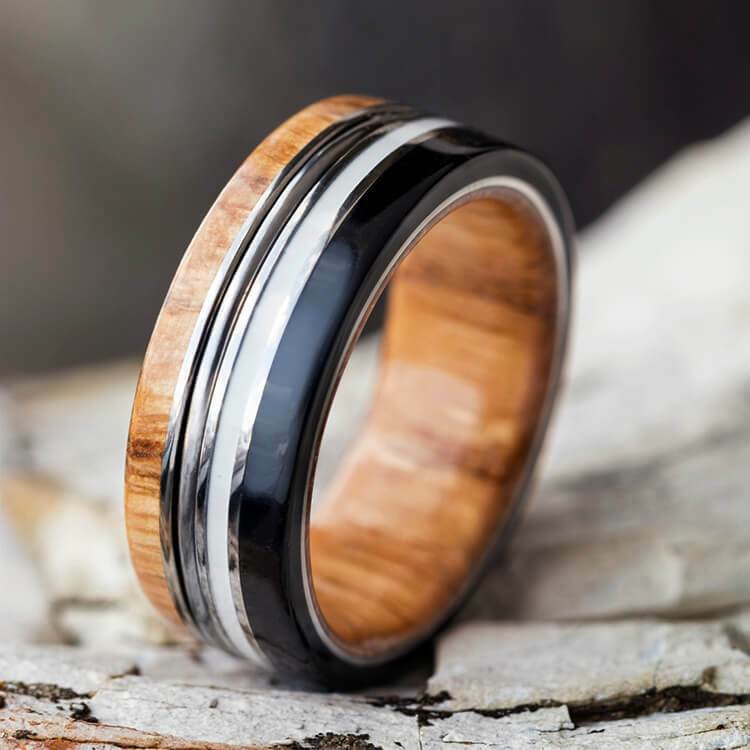 Yellow Gold instead of Titanium.” Or you might say “we want to add our own wood sample to this ring”; or “replace the Blue Box Elder Wood with Black Pearl”. Or possibly, “we would like Bloodwood instead of Tulipwood”. There are hundreds of options. Be as creative as you like! 3. Once we receive your email (and if we have no further questions) we will forward the proposed customized changes to our factory for a free quotation – this typically takes 24 hours. 4. Once we have the price quote we will forward it to you and if you decide to move forward, we will help you complete the order and send you a sizing ring to make absolutely sure that the size you have indicated is correct. The sizing ring is yours to keep at no extra charge; wear it when doing those dirty jobs around the house or working out with weights. Q: When do I actually pay for the custom ring? Once you have agreed to the final style and price, you will pay for the ring and we will send you the sizing ring (see cancellation policy below). Q: What is the lead time once I have selected the design and ordered my custom ring? Typically 4-6 weeks depending upon the style and the amount of customization. Q: May I choose the sizing ring in silver or black tungsten? Yes. Q: Is this sizing ring mine to keep or do I return it? It is yours to keep. Q: What if the sizing ring does not fit – do you ever send additional sizing rings and what is the cost to do so? We will send as many sizing rings as needed to make sure of your correct size – you keep the one that fits best and return the other(s) to us. This service is provided free of charge. Q: If I change my mind after having received the quotation and the sizing ring – is it too late to cancel my order? No. As long as the custom ring has not been ordered with our factory (and remember that you give us the final approval before we place the order), we can modify your specifications or cancel the order. Q: Is there an extra charge for using my own materials in the custom ring? Under normal circumstances we charge $35.00. This includes shipping, handling, and insuring your product to our factory and then back to us. Q: Do I receive a warranty with my custom ring? Yes, manufacturing defects are covered for a full year and after that, custom rings can be refurbished for a nominal fee for as long as you own the ring. Q: Do I receive proof that my custom ring is made with genuine products (such as meteorite or exotic wood)? Yes, each custom ring comes with a signed certificate of authenticity – we recommend you save this certificate in a safe place. Q: How is my custom ring shipped and how am I protected against loss during shipment? We typically use USPS “Signature Required” for your protection. Expedited shipping is also available. If you have additional questions please email sales@simplywoodrings.com.